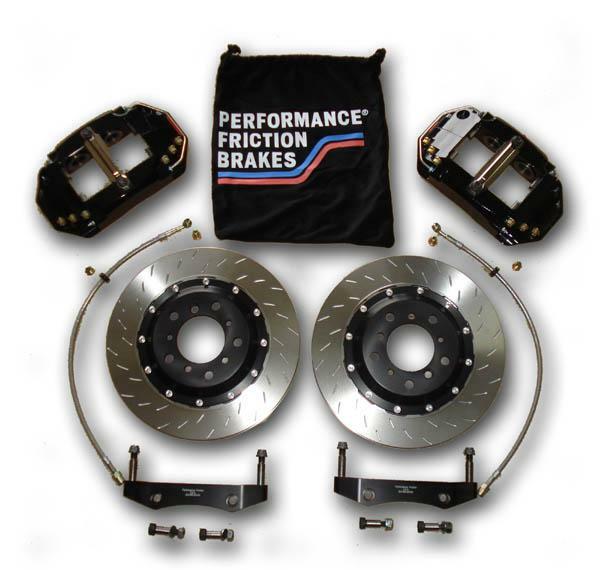 Performance Friction E36 M3/MZ3 Brake Kit BMW - Brakeswap.com - Friction for the Win! The E36 M3 kit was specifically designed to meet the needs of the BMW Performance enthusiast and racer. Brake bias is moved slightly to the rear for improved braking performance in both front-only and 4-wheel applications. The 4-piston Z45 caliper used in the front on this E36 kit is a 2-piece (BMW Prepared legal) design. Unlike every other 2-piece caliper on the market that is cast and machined, the PFC Z45 caliper is a full billet piece, machined from a single piece of alloy. Caliper halves are bolted together with a total of 6 mil-spec bolts and nuts (not threaded into the other caliper half), plus a structural bridge. These two features make this caliper both incredibly light and incredibly strong to reduce flex. The Z29 rear calipers are a 2-piston, 2-piece design similar to the Z45. Calipers are finished with a black anodized surface. The Performance Friction rotors used in all kits are the newest V2 Direct Drive Rotors. Made from a precision casting, all external surfaces are machined to tolerances of 0.004”, including the OD of the vein area that most manufacturers leave rough-cast. This is the only rotor that are mechanically, thermally, and dynamically balanced – meaning you will never warp them because they are balanced in all situations, all temperatures. New V2 hardware reduces weight an additional half pound from the already light V1 components. Front rotors are 323×32mm, rear are 321×20mm – properly sized to maximize performance and reduce weight commonly added with overkill kits. Kit also includes Z-Rated PFC performance pads and the required stainless brake line set. This kit is vastly superior to de-contented kits for street and race applications made by other manufacturers. If you have specific questions or would like a more in-depth explanation of features, please call one of our experienced technical sales reps for more information.